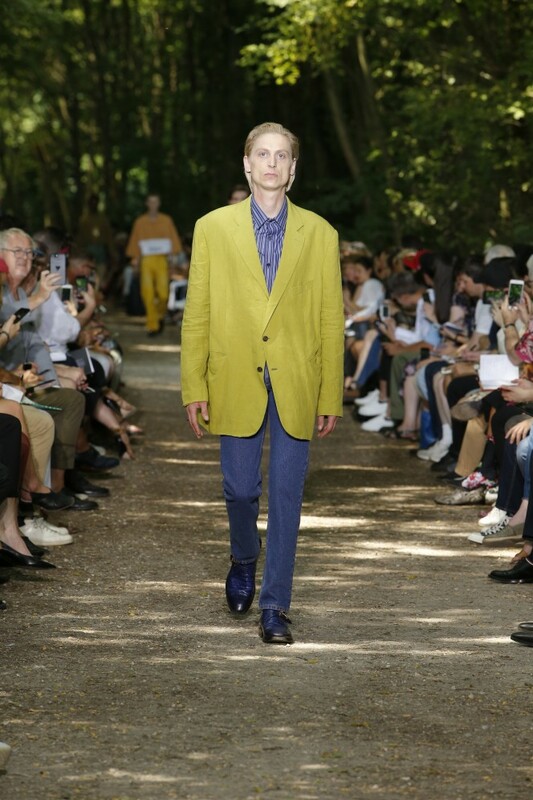 In Paris’ Bois de Boulogne, the corporate men of Balenciaga’s FW17 show were on their family hols. 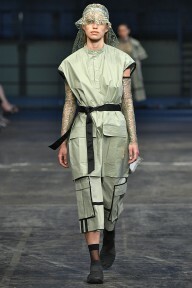 Either side of the dirt path catwalk, guests were seated in two long individual lines as models appeared seemingly out of the park, walking from distance. Without the context of a ‘standard’ show space, there was nothing to ruin the illusion that you were observing characters in an alternate reality. 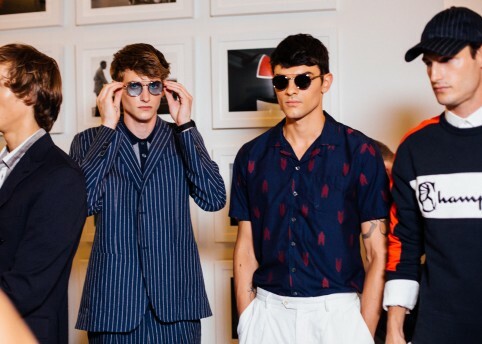 An extension of those FW17 office workers, “these are those same men, out of the office, relaxed and often observed at their happiest,” read the press release. 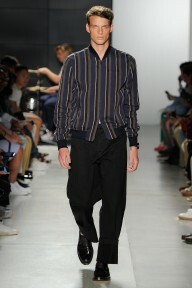 Last season’s ties were not only loosened but left at home, and the corporate tailoring was deserted for outdoor gear that shifted from festival-cool (those transparent waterproofs and hawaiian print shirts), to 90s Jerry Seinfeld-normcore (practical hiking gear, cords, and branded polos). 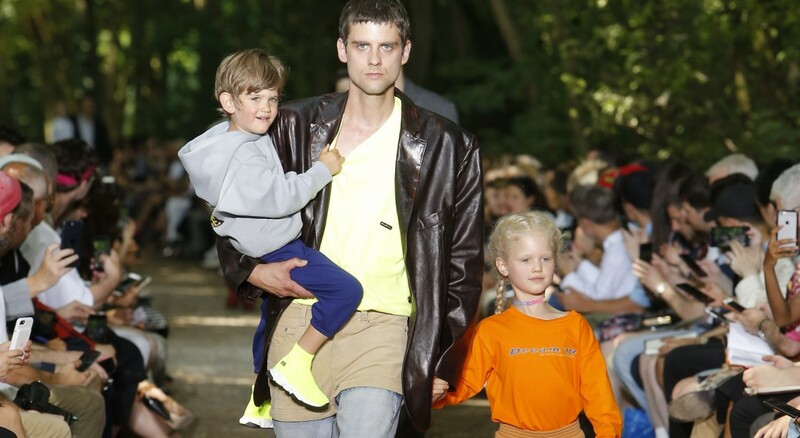 This was an occasion for the whole family, as real model dads walked with their kids, all clad in Balenciaga pieces. 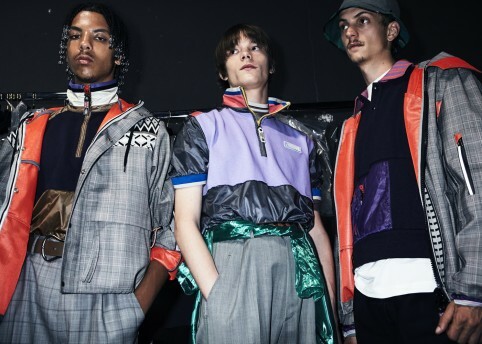 As described by Demna post-show, here the youth represented hope for the future, as spelt out across one child’s ‘the power of dreams’ t-shirt – an optimistic vibe that felt poignantly optimistic in today’s political climate. Back to the clothes. 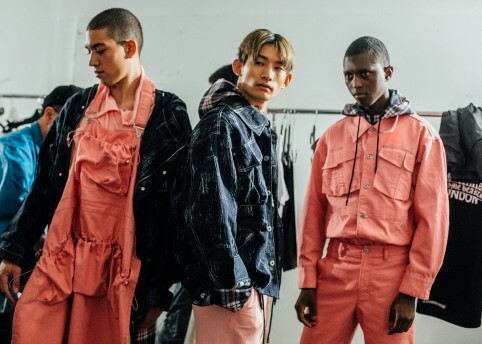 Those big, padded shoulders Demna loves were loosened, and silhouettes came less restrained than previous seasons with added ‘Gran-dad’ slouch created using weights in jacket sleeves and linings to weigh down pieces at particular points. 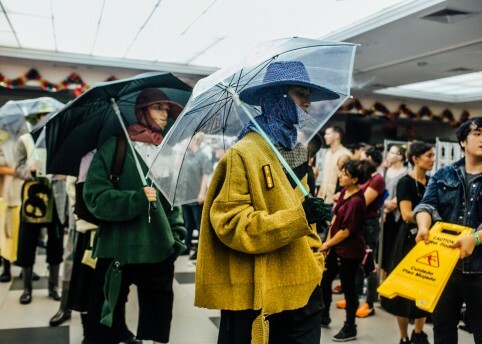 Elsewhere, 90s dad jeans were wardrobe staples, oversized polo shirt sleeves dangled by model’s wrists, patterned vintage store viscose shirts were bold and bordering on bad-taste, and dry cleaning bags were transformed into ponchos. Oh, and the bags? Those now-cult IKEA Balenciaga bags were gone, this season it was all about subverting the supermarket ‘bag for life’, switching canvas for leather – forget the 5p carrier bag charge, you’d best get saving for one of these. On the front row sat Kyle MacLachlan, star of David Lynch’s cult TV show, Twin Peaks. Here, in this woodland setting (although we don’t think they were Douglas Firs), there was more than a hint of Lynchian subversion in Demna’s creations. From the location (“The woods are full of mystery”, according to Agent Dale Cooper), to the opening look of an oversized, crumpled green blazer and striped blue and white shirt that totally reminded us of MacLachlan’s character Dougie Jones in the new Twin Peaks season, to the way Demna skewed societal norms, flipping everyday life on its head to create a twisted reality with a hint of darkness – not least because this woodland hotspot is also a well-known hotspot for illicit after-hours activities.